On January 26, the Chicago Transit Authority announced its ideal path for the proposed expansion of the city’s Red Line south branch. The expansion, the system’s first since 1993, is a major aspect of Mayor Rahm Emanuel’s “Red Ahead” initiative to modernize and lengthen Chicago’s busiest train line. Over 240,000 Chicagoans ride the city’s Red Line on an average weekday, representing over 40 percent of “L” ridership. The “Red Ahead” initiative has already delivered tangible improvements to the second largest transport system in the country. Currently, a transit terminal designed by Chicago-based Exp. is rising on 95th Street, the current southern terminus of the Red Line. 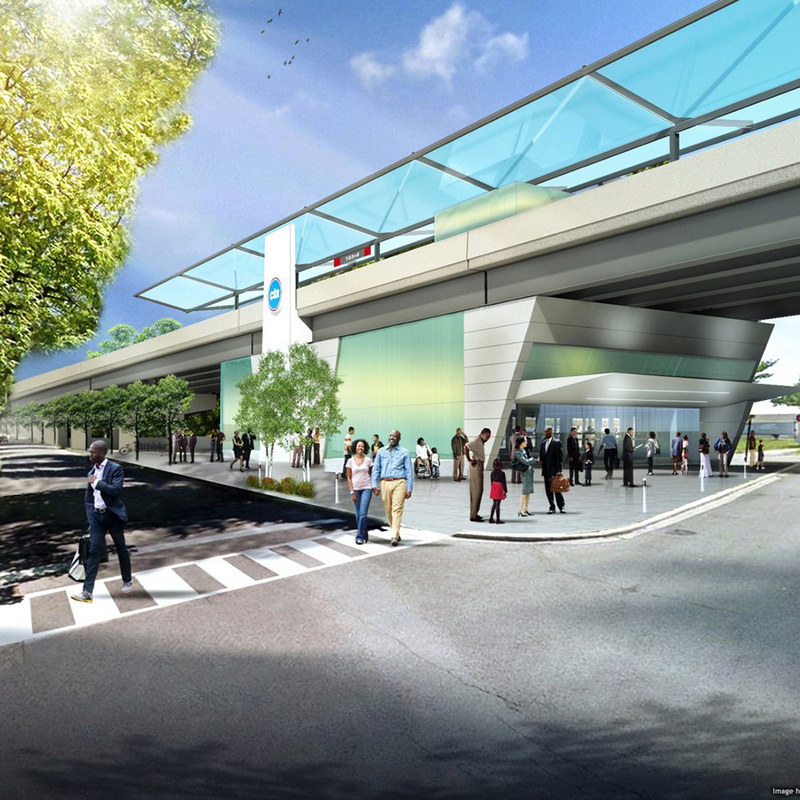 The $280 million project entails the renovation of the existing North Terminal and the construction of an entirely new South Terminal, with the intended goal of increasing passenger capacity for existing and future commuter demand. 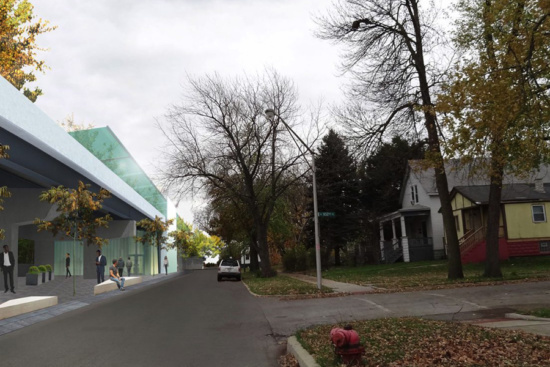 The renovated and expanded station will also include two new public artworks by Chicago-based artist Theaster Gates, and is expected to open in 2018. 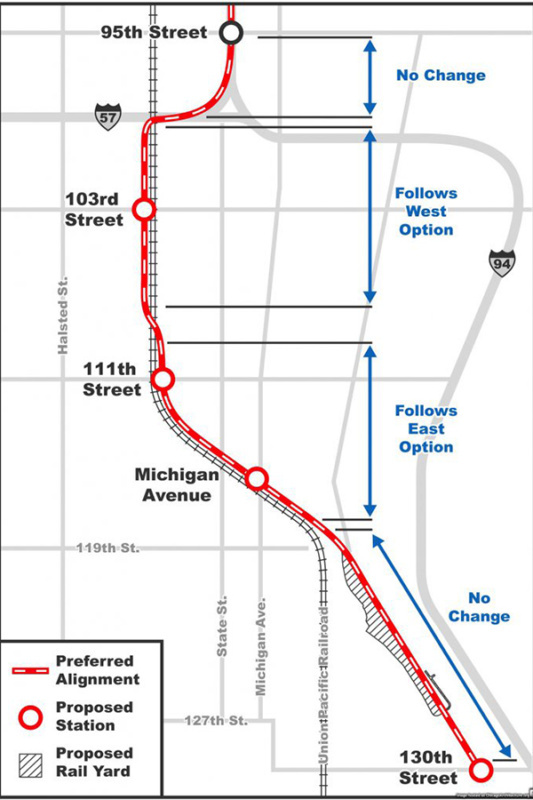 The Chicago Tribune reports that the proposed route runs from 95th Street, along the preexisting Union Pacific freight tracks, to 130th Street. This route will expand the Red Line by 5.3 miles, add four new stations, and is estimated to cost $2.3 billion. State and local funding for the project is not yet fully realized, and considering the budget priorities laid out by the Trump administration’s recently-leaked infrastructure plan, crucial federal funding remains precarious at best. The earliest the project will break ground is 2020, with an approximate four-year construction timeline. The new stations, located on 103rd Street, 111th Street, Michigan Avenue, and 130th Street, will feature bus and parking facilities as a measure to decrease vehicular congestion within the greater Chicago area. As noted by NBC Chicago, the 5.3-mile extension primarily serves Chicago’s Far South Side, an area currently designated as a “transit desert” due to its lack of public transport. Expanding transportation opportunities in Chicago’s South Side could dramatically impact the area’s residents. According to CBS Chicago, the extension of the Red Line could shave 20 minutes off the commute from the Far South Side to Downtown Chicago, boosting the accessibility of affordable housing in the area. Although transportation projects tend to draw the ire of community groups, interviews conducted by the Chicago Tribune with residents and businesses across the proposed Red Line expansion reveal widespread support for the transit initiative. According to Progressive Railroading, a final environmental impact study for the project will be released following a February 13 open house with the surrounding community. Following the study, the CTA can apply for over $1 billion in federal funding. If funding is secured for the extension of the Red Line, the CTA will still have to contend with the approximately 150 private parcels along the proposed route. The financial and logistical hurdles are great, but the large-scale expansion of Chicago’s “L” could prove a boon to residents and city alike.